The selection committee headed by prime minister Narendra Modi is likely to meet on the 24th January to finalise the name of the next chief of CBI (Central Bureau of Investigation), as the term of the current CBI chief will be over on the 31st January. The government has, reportedly, initiated this process since December 2018. In the meantime, a controversy is already brewing regarding the appointment of Nageshwar Rao as the interim director; but that’s another story. Just like the appointment of information commissioners under the Right to Information (RTI) Act, the naming of the selection committee and the short-listed candidates for these posts also demands transparency. While, in the past, this information was available under RTI requisition; recently, the department of personnel & training (DoPT), which appoints them has defied the Supreme Court order which directed it to make this information public. Now, the DoPT is playing the same game of opaqueness in the case of the appointment of the next CBI chief. Activists Anjali Bharadwaj and Amrita Johri filed RTI applications regarding details of the meetings of the selection committee (which consists of the PM, the leader of the Opposition, and the chief justice of India (or a Supreme Court judge nominated by him) including the date of meetings, copy of the agenda of meetings, copy of the minutes of meetings and details of persons who attended each meeting. Information was sought under the RTI Act about any process adopted by the government to short-list candidates for consideration by the selection committee; a copy of any short-list prepared; and details of any committee set up to prepare such a short-list. She fears a repeat of December 2016 as she says, “When the previous CBI director retired, the government failed to convene a meeting of the selection committee to appoint the successor, and Mr. Rakesh Asthana was named interim director. After a PIL was filed in the Supreme Court, Mr. Alok Verma was selected and appointed as director. In order to ensure public trust in the institution of the CBI, it is critical that appointment of the director be made in a timely manner and there be transparency in the process of appointment, which will enable public scrutiny." e) Permission for me to inspect all the files concerned with the said issue. d. Name and designation of persons attending each meeting. 1. Information (as defined in Section 2(f) of the RTI Act) on the process being adopted by the government to prepare a short-list for the consideration of the selection committee set up (under Section 4A of the Delhi Special Police Establishment Act) to appoint the CBI director upon the retirement of the incumbent director. 2. Copy of any short-list prepared by the government for consideration by the selection committee set up (under Section 4A of the Delhi Special Police Establishment Act) to appoint the CBI director upon the retirement of the incumbent director. f. Names and designations of persons attending each meeting. The RTI Act? The law enacted with much fan fare 'to contain corruption and to hold Governments and their instrumentalities accountable to the governed'? 13 years down the line it can be said with confidence and total conviction that this simple, clear and unambiguous law has been subverted by the very information commissioners appointed, tasked and empowered to enforce it. In fact the provision to reduce information commissions to just rehabilitation homes for the favourite babus retiring from service was there in the Act itself. And it is in the form of pay, perks and status of Chief Election Commissioner, Election Commissioner and Chief Secretary to the information commissioners whose task is simpler than that of a munsif in our judicial system. If that was an act of commission the act of omission is the absence of ban on former public servants being employed as ICs/CICs on the grounds of vested/conflict of interests. 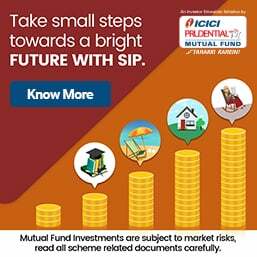 There are plenty of blogs on how the RTI Act has been murdered at raviforjustice.blogspot.com and the titles are as explicit as 'RTI- exposing the idiots and traitors among public servants'. 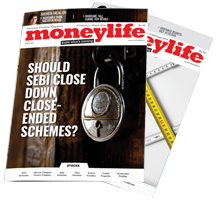 Last week, Moneylife had published an interview with Dr Pallavi Darade. Her raids on 350 outlets from where four leading online food app companies procured food for their customers, revealed unhygienic conditions in 112 outlets, which did not have registered licences either. Dr Darade concluded by pointing to the shocking outcome of the searches and raids that there were several parameters that needed to be applied under the Food Safety Act, which were not complied. In order to procure more details on the reports of the raids, I decided to file an RTI application with the public information officer, Food & Drugs Administration, government of Maharashtra. And that was the first stumbling block. During the entire day on Wednesday, its website http://fda.maharashtra.gov.in/ just did not open. I wanted to find out the name of the public information officer and the correct office address. I got access to it only today, Thursday at 4.30 am. However, I am appalled to note that when you click the `RTI Act’ icon on its homepage, you get no information on the name of the public information officer or the appellate authority for filing your RTI requisition/appeal (http://fda.maharashtra.gov.in/SPK-D-3A11(1).pdf). This pdf copy that has been posted on its website names designations of officers without any names. Providing the names of PIOs is compulsory under Section 4 of the RTI Act. Besides, FDA is a government agency, which should be directly connected with the people as it deals with the crucial element of their health, and what better way than interacting through the public domain, that is, its website? I have decided to file a complaint with the state information commission against FDA for not following the proactive disclosures under Section 4 of the RTI Act. Hence, I shall communicate Adheer Pai’s feedback to her. 1. Please provide copies of all reports of raids conducted on 350 or more outlets of online food service apps—Zomato, Swiggy, Uber Eats, Foodpanda and any other. 2. Please provide a copy of the proposal and decision to conduct raids on Zomato, Swiggy, Uber Eats, Foodpanda and any other. 3. Please provide copies of photographs and videos taken of the kitchen, toilets and any other that may have been clicked or shot, during the above raids. 4. Please provide a list of all the outlets that were raided along with addresses and list of outlets. 5. Please provide copies of correspondence of authorities of Zomato, Swiggy, Uber Eats, Foodpanda and any other to your office, in this matter. 6. Please provide mandatory rules and regulations for procuring a food license and a copy of action taken when there is a violation of such rules and regulations. 7. Please provide a copy of FDI’s order to close 10,000 or more outlets of above food companies. 8. Please provide a copy of the proposal for further action/action taken against Zomato, Swiggy, Uber Eats, Foodpanda and any others for being responsible for putting their customers’ health in danger. Let us make this into a public movement through the RTI route. We cannot afford an entire generation of unhealthy youngsters who are going to be the future citizens of this country! 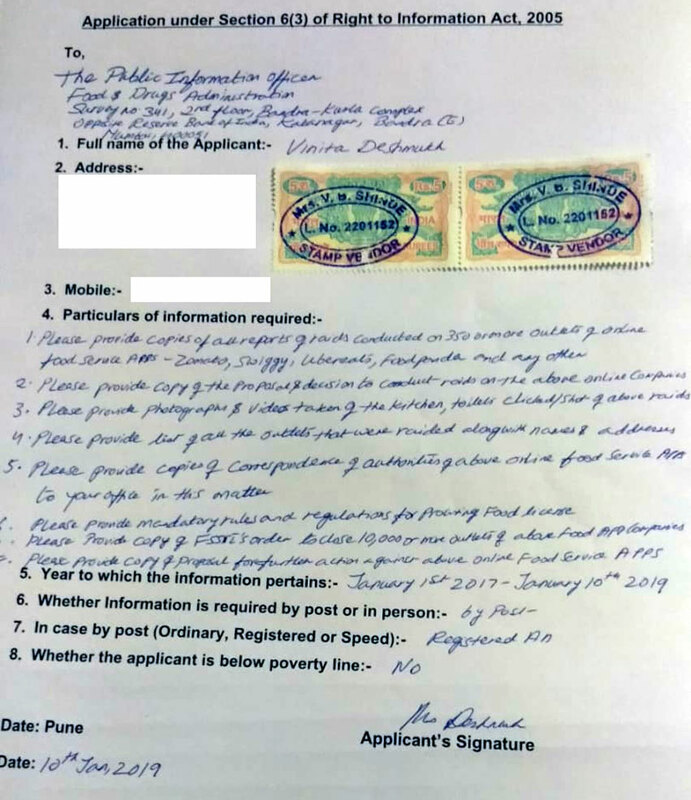 RTI Applications can also be filed online with State Government of Maharashtra and PIO or specific department office is not known please file with GAD of CM Office. They have been very helpful in transferring my RTIs to the various subordinate offices all over MH under 6/3. Online also means no need to buy stamp or stationary. You can file in English and ask for a reply in English but will get a reply in Marathi. Thank you Mr. Malik. Your info will come in handy for citizens in Mumbai. Unfortunately I am a NRI and not a citizen of India any longer but I wish Indian consumers all the best in their struggle for improving the hygiene in the eateries. I have copied Ms Deshmukh's and your suggestions and plan to send it to as many of my relatives and friends as possible and exhort them to hold the eateries accountable. This year I have seen several restaurants displaying signs saying that their premises are fire regulations compliant, thanks to the pressure created by consumers after last year's horrific fire in a restaurant. I hope that this movement for hygienic restaurants catches on. We all will benefit from it. Ms. Deshmukh, this is a call to arms for all citizens. You are persistent and meticulous. I hope your call is taken up by many in Mumbai. Wish your drive all the best.